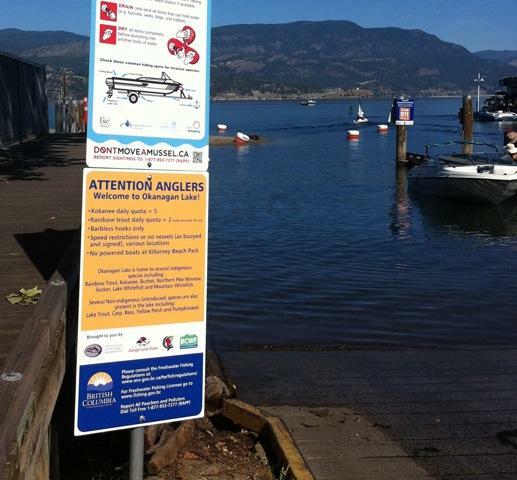 We are proud to announce that Phase One of our Okanagan Lake Fishery Signage Project was completed in March with the installation of fishery based signage at the five major boat launches in Kelowna, namely Sutherland Park, Water St, Queensway, Cook Rd (at the Eldorado Hotel) and Cedar Creek Park. The signs design and construction were a collaborative effort from our partners in the project, ONA, OSCI, BCWF, MFLNRO and the City of Kelowna. The concept for the project came from a distinct lack of signage related directly to fishing on Okanagan Lake and an apparent lack of awareness about the fishery from the general public. It seems that over time some residents and visitors to Kelowna have developed somewhat of a ‘water park mentality’ when it comes to the lake and overlook the fact that the lake is an ecosystem, spawning habitat and home to numerous fish species both indigenous and non-indigenous. 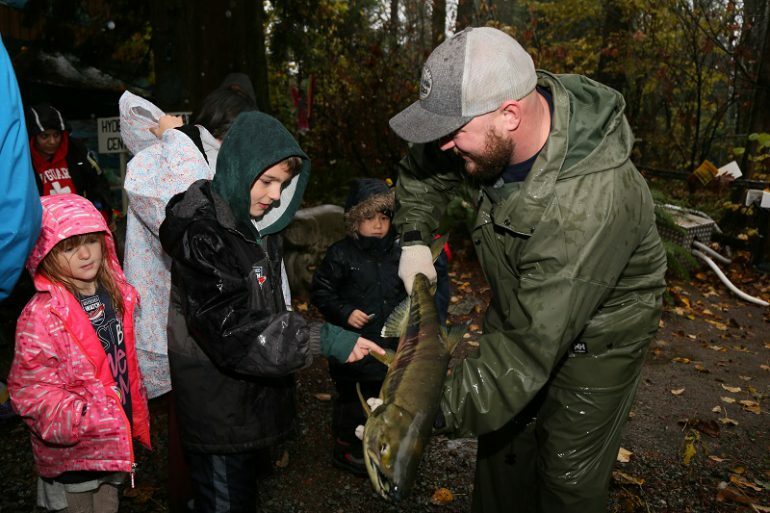 The recreational, cultural and economic value of this fishery is significant and has the potential to be a great contributor to our community, just like fisheries all over Canada. The near extirpation of many salmon species from the Okanagan Valley Watershed is another issue that has recently begun to be reversed through efforts on both sides of the border and a concerted effort by the ONA to restore the once plentiful sockeye runs. Okanagan Lake was once an end point for these salmon species and we may one day soon see several salmon species again returning to the lake after their long journey up the Columbia and Okanagan Rivers. The Okanagan Salmon Community Initiative (OSCI) and it’s steering committee is another group that is helping in this process by offering recreational anglers and sport fishing guides the opportunity to help harvest the sockeye for the ONA in order to aid the generation of a continued revenue source for the re-introduction of salmon species. Both groups were valuable partners in our signage project and we hope the visibility of their logos on the signs will help bring awareness to their efforts. Phase Two of the project is to see signs installed at the the major boat launches in Vernon, Winfield, Summerland, Peachland and Penticton, which we hope to complete by the spring of 2017. Our ultimate goal is for healthy, vibrant and sustainable fisheries in the Okanagan Valley and Region 8, and to see recreational and sport fishing rooted in Okanagan Valley Tourism like it is in many other regions of BC. This signage project is the first step in our mind, to gaining ground towards this goal while helping to protect and preserve the current fishery by developing a culture of stewardship from the community at large and visitors to Okanagan Lake. We would like to thank all our partners for their support and participation in the project and look forward to completing Phase Two of the project with their continued help, and that of the local municipalities that will ultimately benefit from increased awareness and a healthy Okanagan Lake fishery.